But now, by the greater and more admirable grace of the Saviour, the punishment of sin is turned to the service of righteousness. For then it was proclaimed to man, “If you sin, you shall die;” now it is said to the martyr, “Die, that you sin not.” Then it was said, “If you trangress the commandments, you shall die;” now it is said, “If you decline death, you transgress the commandment.” That which was formerly set as an object of terror, that men might not sin, is now to be undergone if we would not sin. Thus, by the unutterable mercy of God, even the very punishment of wickedness has become the armor of virtue, and the penalty of the sinner becomes the reward of the righteous. For then death was incurred by sinning, now righteousness is fulfilled by dying. In the case of the holy martyrs it is so; for to them the persecutor proposes the alternative, apostasy or death. For the righteous prefer by believing to suffer what the first transgressors suffered by not believing. For unless they had sinned, they would not have died; but the martyrs sin if they do not die. The one died because they sinned, the others do not sin because they die. By the guilt of the first, punishment was incurred; by the punishment of the second, guilt is prevented. Not that death, which was before an evil, has become something good, but only that God has granted to faith this grace, that death, which is the admitted opposite to life, should become the instrument by which life is reached. The book is attractive, with colorfully -drawn and brightly-printed illustrations throughout in a large “coffee table” size that facilitates parents reading it to their children. We have “trial tested” this book in our home and the kids could not get enough of it. We will have read through it several times before our family outgrows it. I am sure of it. This book would be great to read with your children or grand-children. Augustine was a bishop (overseer), theologian, and preacher of the gospel in a dusty two-bit town called Hippo in North Africa in the late 4th and early 5th centuries A. D. This was a formative period in the Church. Christianity had become established by Roman law after long periods of persecution, and the liberty given to the Church allowed for free course in preaching and transmission and copying of the Scriptures. This freedom led to great advances in theology, preaching, and the availability of the Bible. There were also important controversies at this time which helped to clarify for the Christian Church what the Scriptures teach: their most basic doctrines. Such controversies gave to Church an opportunity to study the Scriptures more carefully on the topics in question and get a more thorough understanding of what Christians had always believed. The 4th century birthed the landmark Nicene Creed, which clarified Christian belief on the doctrines of the Deity of Christ and the Trinity. Because of the tremendous influence of towering figures like Augustine, this period of Church history is known as the patristic age, meaning: age of the fathers of the Church. Augustine was a man who came to Christ later in life, after a mischievous youth and dabbles with a mystery cult that was popular in his day. The tender story of Monica, his faithfully-praying Christian mother, is a gripping part of his life story recounted in the book. Her prayers being answered, Augustine would be converted to the true Christian faith, and would later go on to serve God as a bishop, pastor, preacher, and theologian. Through his preaching and writing he would become without a doubt the most influential figure in the history of the western Church. Hailed as a great saint and Church father still today by the Roman Catholic Church, his writings on Scripture were immensely influential in the life and ministry of key Protestant Reformers of the 16th century like Martin Luther and John Calvin, (through whose ministry the Church was brought back into conformity with the Holy Scriptures after a long period of decline.) Augustine’s influence and language is still keenly felt by the Church today. He is especially known for his contributions to the Christian Church’s understanding of the doctrines of Original Sin (the natural and innate sinfulness inherited by every human being from the sin of Adam our ancestor) and the supremacy of God’s grace in bringing the sinner to life in Christ. 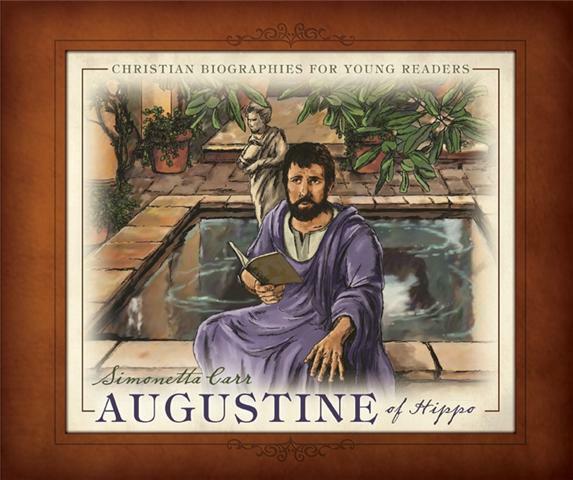 In Simonetta Carr’s book, readers will be gripped by the story of Augustine’s wrestling with the Bible before he came to the faith, his prayerful and beloved mother, his conversion experience, his reluctant ordination to the gospel ministry, his response to the sacking and ransacking of Rome by Germanic barbarians, his wrestling with the doctrines of sin and God’s sovereignty, and the debates and controversies that he waged to defend the truth of the Scriptures against various errors and movements that arose while he served as bishop of Hippo. As a way of introducing a taste of Church History to children, this book will inspire in its readers an appreciation for the ancient heritage of our common faith as Christians and praise for the God who has directed and protected His Church through all ages of Church history.